Millions of teachers across the globe are already using the iPad to personalize learning and inspire creativity, Apple says. 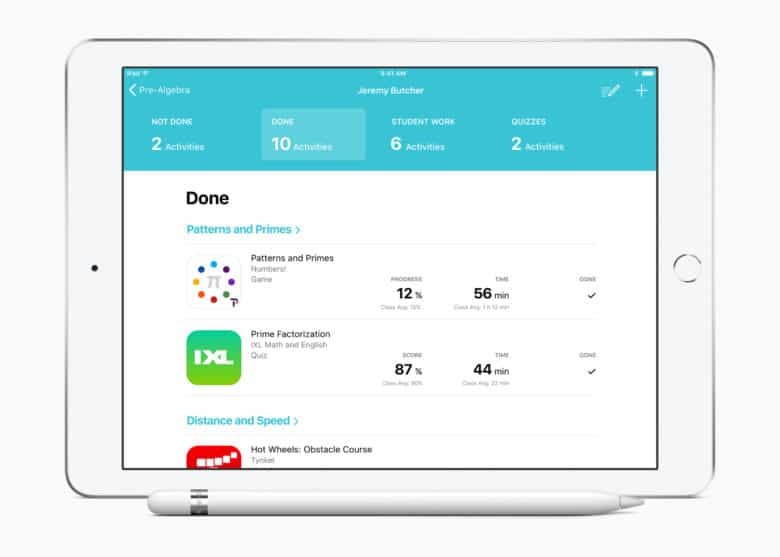 With Schoolwork, which was unveiled alongside the new 9.7-inch iPad this spring, managing, monitoring, and assisting with assignments just got a whole lot easier. Schoolwork lets teachers create new assignments with almost any type of content that are sent directly to students’ iPads. They can include web links, PDFs, other documents, and even specific activities inside other apps. Students can use the app to stay organized and keep track of the work they need to complete, and to ensure they never miss another deadline. While the work is underway, teachers can keep an eye on students’ progress and performance. Not only does this make managing assignments easier, but it also helps teachers tailor their teaching to the needs and potential of each student. Schoolwork also allows one-to-one collaboration with those who need a little assistance. And because this is an Apple product, privacy and security features are built in so that schools have complete control over all accounts — and control over when student progress information is shared. Schoolwork is designed to work perfectly alongside Apple’s existing Classroom app, which is now available on Mac as well as iOS. Classroom gives teachers the ability to control which apps are used on student devices to help them stay on track. It can also be used to monitor student screens during class, to share documents, and to assign shared iPads. Visit the Education page on Apple’s website to get started with Schoolwork and Classroom today.